April 03, 2019: The Assam Higher Secondary Education Council has announced the examination dates for its SEBA HSLC and AHSEC HSE exams for 2019. As per the announcement, the AHSEC HSE (Class 12) exams was conducted from 12 Feb, 2019, and ended on 14 March, 2019. The SEBA HSLC (class 10) exams will also be conducted in the months of February and March and will tentatively commence from 14 Feb 2019 and continue till the 6 March, 2019. The timetables for both the AHSEC HSE and SEBA HSLC exams can be found here and here. The Assam HSLC Result 2018 was announced on 25th May in 2018. In 2019, too, the results are expected to be announced in the month of May 2019. The Board of Secondary Education, Assam (SEBA), conducts the High School Leaving Examination (HSLC) for the students of Class 10. SEBA regulates, supervises and develops the system of Secondary Education (Class 10) in Assam. The SEBA HSLC examination 2018 was conducted from 16 February to 8 March, 2018. This year, for 2019, the official dates for the SEBA HSLC 2019 are out yet SEBA HSLC examination 2019 dates will be held from 14 Feb to 6 March 2019. The timetables for both the AHSEC HSE and SEBA HSLC exams can be found here and here.The Assam result for the board exams are expected to be in keeping with the regular Assam result declaration pattern. The Assam Board HSLC Result 2018 was also published online on the official website of the Assam Board as well as on our website, examresults.net on 25th of May, 2018. In 2019, too, the Assam HSLC Result SEBA 2019 is expected to be released in May 2019. Get your Assam Class 10 SEBA Result 2019 HERE and get your Assam Class 12 AHSEC HS Result 2019 here. 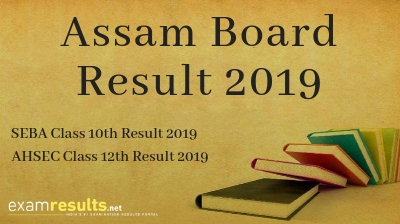 The Secondary Education Board of Assam (SEBA) has decided to announced the HSLC result (High School Leaving Certificate) and AHM Result (Assam High Madrassa) at the midnight hour of May 20th. This is for the first time that the results will be declared on midnight. Students can also check their Assam board results by downloading our Android app and also can join our Facebook group to get the latest exclusive updates about exam results..
How to Check Assam Board Result, HSLC Result SEBA and AHSEC HS Results 2019? Type the desired state name, for example, examresults.net/Assam/. Look for the desired board button, for example the button that says HSLC Results 2019 or AHSEC Result 2019 Click Here. Take a print out of your Assam Board Result. You can also keep yourself abreast of Assam results, get notifications about possible Assam board results dates, and check your AHSEC result and SEBA results on our Android App, ExamResults. You can also join our Facebook group for the latest updates on Assam results. The official board websites, www.ahsec.nic.in and www.sebaonline.org can also showcase the Assam results 2019. Traditionally, the SEBA HSLC Assam board results are announced in the month of May. This year there is chatter that the Assam board results will be announced at the same time but there is no official confirmation about whether the SEBA result will be definitively announced around the same time. Similarly, the AHSEC HSE results 2019 are also generally announced in May and this year, too the class XII Assam board result is expected to be announced around the same time. Around 6 lakh students sat for the AHSEC HSE and SEBA HSLC exams held by the Assam board in 2018. In the year 2018, the overall pass percentage of students who appeared in the SEBA HSLC exam was 54.44% and for the AHSEC HSE exam was Arts: 74.68%, Commerce: 84.64%, and Science: 85.74%. In the table below, you can check the pass percentage for the past two years for both, the SEBA HSLC exam and the AHSEC HSE exam. We will update this table with the pass percentage for 2019 once the results for this academic year are out. Where To Check Assam Boards HSLC Result and AHSEC Result? Students who have appeared for the SEBA HSLC 2019 and AHSEC HSE exams 2019 can check their assam results on the official website of the Assam board, sebaonline.org, ahsec.nic.in or on examresults.net. You can also download our Android app and check your results on your phone. The Board of Secondary Education, Assam (SEBA), conducts the High School Leaving Examination (HSLC) for the students of Class 10. SEBA regulates, supervises and develops the system of Secondary Education (Class 10) in Assam. The SEBA HSLC examination 2019 is currently underway and is being held from 16 February to 8 March, 2019. The Assam Higher Secondary Education Council (AHSEC) regulates, supervises and develops the system of Higher Secondary Education (+ 2 Stage) in Assam. The Assam HSSLC/Class 12 Exams 2019 started on the 23rd Feb and will continue till 22nd March 2019 this year. The Assam Class 12 Exams 2019 will be conducted for Arts, Science, Commerce and Vocational Groups.